There is another way to unearth some excellent bargains all year round, however: outlets. Outlet shopping is somewhat new to Italy, and generally involves a bit of detective work. Most outlets are located in the outskirts of cities, either grouped into shopping centers or adjacent to the company's factory, and cannot be reached on foot or by public transportation. Shopping centers also have food courts or informal restaurants and can take an entire day to explore; factory stores or outlets are anywhere from mid-sized to tiny and can be perused in an hour or two. 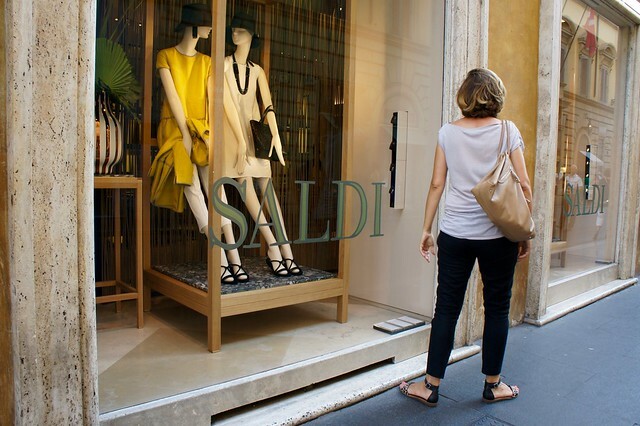 Though some mid-level brands in Italy have outlet stores, most carry high-end and luxury brands so even if the prices are much lower than boutiques, you may still be surprised. That Prada purse may be 50% off, but half of €5,000 is still €2,500! Here are a few of the most popular outlet stores and centers in Italy. Happy shopping! Perhaps the most popular outlet in Italy, the beloved Space Factory Outlet includes all the Prada lines: Prada, Miu Miu, Helmut Lang, Prada Sport and Church. Located about an hour outside of Florence, Space can be either a dream come true or a total bust depending upon your timing. You may find the store crammed with excellent stock, a variety of sizes, and excellent prices. Or you may get there just minutes after a Japanese tour bus has pulled away and find the place virtually picked clean. Address: 52025 Montevarchi, Province of Arezzo (near The Mall, so can be combined in one trip). About half an hour from Florence, the Fendi factory outlet carries clothing, accessories, and - of course - bags from the Fendi label. Address: Via Pian dell’Isola 66/33, Rignano sull’Arno, Reggello (near The Mall, so can be combined in one trip). About 20 minutes outside of Rome, this outlet village is part of the group which also owns Serravalle outside Milan and includes about 150 boutiques from high-end and luxury labels like Valentino, Moschino, Versace, Roberto Cavalli, Furla, and Patrizia Pepe. There are a number of informal eateries in the shopping center, so you can easily spend a day shopping.